The Queens rapper said she will be performing in Manchester in 2018. 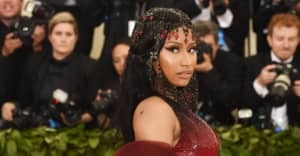 Nicki Minaj isn't planning to change her upcoming tour schedule after a horrific terrorist attack at the Manchester Arena that left 22 dead and at least 59 people injured following an Ariana Grande concert on May 22. When approached by a TMZ reporter in the airport, Minaj said that her live shows will go on. "We don't operate in fear," the Queens rapper said. "That's a powerful statement," the reporter said, and Minaj replied, "I'm a powerful woman." She also shared a message with Ariana Grande and her fans: "Ariana is my sister, I love her and I love the people of the U.K. and I'm devastated by the news. It's heartbreaking." Watch Nicki Minaj's statements below.